The field of ecohydraulics integrates hydrodynamic and eco-dynamic processes. While hydrodynamic processes are usually well described by partial differential equations (PDE’s) based on physical conservation principles, ecosystem dynamics often involve specific interactions at the local scale. Because of this, Cellular Automata (CA) are a viable paradigm in ecosystem modelling. All cells in a CA system update their states synchronously at discrete steps according to simple local rules. The classical CA configuration consists of uniformly distributed cells on a structured grid. But in the field of hydrodynamics, the use of unstructured grids has become more and more popular due to its flexibility to handle arbitrary geometries. The main objective of this research is to identify whether the CA paradigm can be extended to unstructured grids. To that end the concept of Unstructured Cellular Automata (UCA) is developed and various UCA configurations are explored and their performance investigated. The influence of cell size was analyzed in analogy with the Finite Volume Method. A characteristic parameter —min distance of UCA– was put forward and tested by numerical experiments. Special attention was paid to exploring the analogies and differences between the discrete CA paradigm and discrete numerical approximations for solving PDE’s. 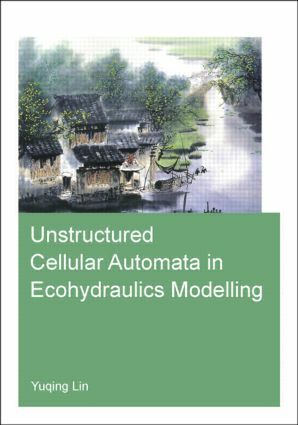 The practical applicability of UCA in ecohydraulics modelling is explored through a number of case studies and compared with field measurements. Ms. Yuqing LIN is from China and obtained her Master of Science degree in Hydroinformatics (with distinction) in 2008 at UNESCO-IHE in Delft, the Netherlands. She continued as a fulltime PhD fellow at Deltares, Delft University of Technology and UNESCO-IHE, conducting her research on ‘Unstructured Cellular Automata in Ecohydraulics Modelling’. Her research interests include: mathematical modelling, ecohydraulics, unstructured cellular automata and environmental hydroinformatics. IHE Delft PhD programme leads to a deepening of a field of specialisation. PhD fellows do scientific research, often with conclusions that directly influence their region. At IHE Delft, PhD researchers from around the world participate in problem-focused and solution-oriented research on development issues, resulting in an inspiring research environment. PhD fellows work together with other researchers from many countries dealing with topics related to water and the environment. PhD research is often carried out in the ‘sandwich’ model. Preparation and final reporting – the first and last portion of the programme – are carried out in Delft, while actual research is done in the fellow’s home country, under co-supervision of a local institute. Regular contacts with the promotor are maintained through visits and long-distance communication. This enables researchers to employ solutions directly to problems in their geographical region. IHE Delft PhD degrees are awarded jointly with a university. The degrees are highly valued and fully recognised in all parts of the world.